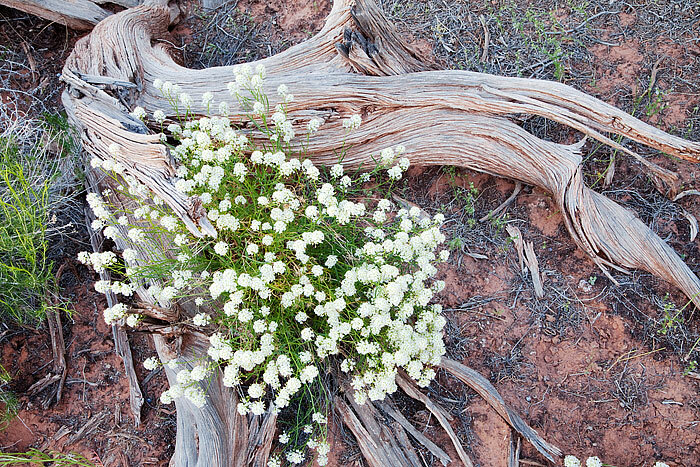 Yarrow wildflowers grow out of the base of a Utah Juniper skeleton. I discovered this interesting dichotomy near Mineral Creek oustide of Moab, Utah and Canyonlands National Park. Yarrow was blooming all over the plateau near Island of the sky and while exploring the area happened to stumble upon this scene. The Junipers located around the Colorado Plateau are impressive in both life and death. Photo © copyright by Thomas Mangan.